Labor Day has come and gone. The kids are back to school. Everyone, including parents and caregivers, are back to work. It is a busy time. There are more wardrobe changes than, let’s say…Lady Gaga. That means parents and caregivers are going to be spending exponentially more time in the laundry room. For parents with school-aged kids and toddlers at home, it can be particularly challenging. That’s why many parents opt to make their toddlers part of the laundry routine. In fact, according to the American Cleaning Institute, more than 50 percent of parents have their toddlers with them while they do laundry. 1. Consider giving your laundry a small facelift. When you’re doing small projects around the house this fall, install new shelves or create cubbies to reorganize where supplies and cleaning products need to go. Ensure there are specific spaces that can safely store baskets, supply bins and hampers. 2. Childproof your laundry room. First and foremost, keep liquid laundry packets and other detergents up and away from kids, and never let your little ones handle or hold them. Make sure bottles are secured and closed in their originally stored packaging out of sight. Order a free cling sticker from Packets Up! and place it on your appliances as a reminder. 3. Use laundry time as a moment to teach safe habits. Talk to your children and teens about the potential risks of unintended exposures such as the ingestion of laundry products. 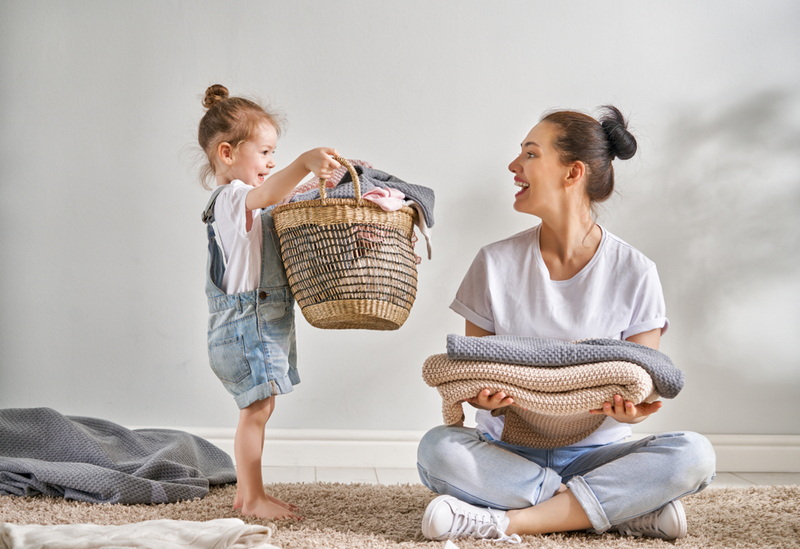 Engage loved ones in a weekly step-by-step laundry routine and talk about how to use laundry products and set ground rules and boundaries in the room. For your little ones, make it fun and download kid-friendly activity sheets that displays the do’s and don’ts in your laundry room. Kids will be kids. As a parent or caregiver, you play an essential role in the safety of your family regardless of the season. You can be more efficient in the laundry room and help make a difference by ensuring your loved ones are properly using and storing liquid laundry packets. Happy cleaning and don’t forget to keep Packets Up! Brian Sansoni is Vice President of Communication and Outreach at the American Cleaning Institute (www.cleaninginstitute.org). ACI is the trade association for the cleaning products industry in the United States, based in Washington D.C. Since 2000, Mr. Sansoni has served as the chief spokesman for ACI and is responsible for the association’s external and internal communication activities, including media relations and promotion of the ACI’s technical, government affairs, sustainability and consumer outreach activities. Prior to joining ACI, Mr. Sansoni worked at the Grocery Manufacturers of America (now Grocery Manufacturers Association), the world’s largest association of food, beverage, and consumer product companies. While there, he served as Senior Manager for Public Policy Communications, working as a spokesman for association positions on issues like food biotechnology, food and product safety, obesity, and irradiation. Mr. Sansoni’s role as a trade association communicator has led to appearances on such venues as NBC Nightly News, The Today Show, Fox News, CNN Talkback Live, Good Morning America, MSNBC, and numerous local TV news programs. As a spokesman and media relations expert, he has successfully placed his trade associations in such publications as the New York Times, Wall Street Journal, Washington Post, Los Angeles Times, USA Today, Time magazine, and numerous wire stories and local and regional newspapers. For more than eight years, Sansoni was a press secretary in the United States House of Representatives, serving as a spokesman for four Members of Congress. Prior to that, he worked a radio news reporter in Pennsylvania and New Hampshire. Sansoni is a graduate of Lock Haven University in Lock Haven, PA, where he received a B.A. in Broadcast Journalism. Hey Mom & Dad: Got those “Back to School” Woes? Crib vs. a Bed — Is Your Child Ready?